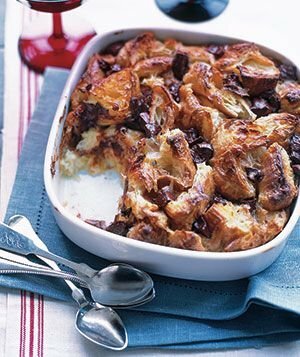 This is a 5-star bread pudding and is one of our favorite desserts. We like it warm with vanilla ice cream. Heat oven to 375° F. Butter an 8-inch square or other shallow 2-quart baking dish. In a large bowl, whisk together the egg yolks, milk, cream, sugar, vanilla, salt, and nutmeg. Add the croissants and chocolate and mix to combine. Transfer the mixture to the prepared baking dish and bake until set and a knife inserted in the center comes out clean, 30 to 40 minutes. Serve warm or at room temperature.